Few midweek meetings have the same atmosphere as the Student Raceday at Limerick but I'll be giving it a miss today after I aggravated an old injury at Aintree on Saturday. With Fairyhouse and Punchestown coming up I've just been advised to give a rest for a few days and I hope to be back riding shortly. There is a chance I could miss a winner for Jessica Harrington as she runs THEGOAHEADMAN (4.15, Limerick) who wears cheek-pieces for the first time and has a real good chance. 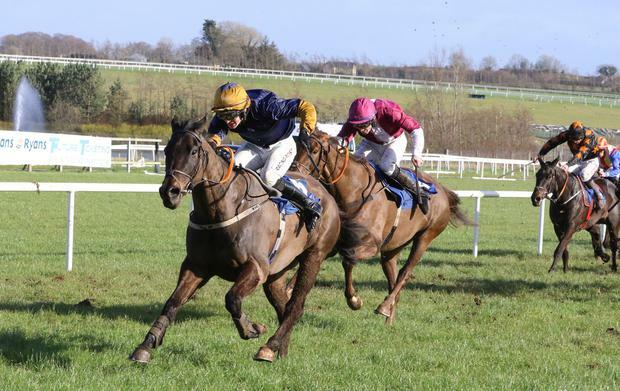 Paddy Kennedy, who got a great spin from Magic Of Light in the National on Saturday, rides Thegoaheadman and if running the same sort of race as he did at Wexford last Friday evening he must have a great shout of opening his account. Magic Of Light just fell short of Tiger Roll and maybe if she hadn't made a few mistakes on the way around it would have been closer but you can take nothing away from Tiger Roll. I'm sure the plan will be to aim Magic Of Light back there next year for another crack at the race. The Tiger Roll duo of Gordon Elliott and Davy Russell would look likely to partner winners on the card today. The feature race looks like it could go the way of STOOSHIE (4.45, Limerick) who would be the preference with the benefit of a run over Na Tachtalai Abu ad Internal Transfer. Earlier on the card DARLING MISS (3.10, Limerick) showed enough the last day for connections to expect her to go close in the first division of the 2m5f handicap hurdle. Billy Lanigan's WEST IS BEST (3.40, Limerick) is top weight in the second division but it looks a weaker division so I'd expect him to record another course and distance success. I won on THE CHURCH GATE (5.20, Limerick) at Christmas and he runs in the beginners chase that is for horses rated 116 or less. He has chasing experience and should be a good ride for Keith Donoghue.